If you love the outdoors and the true Aussie lifestyle – you’re going to find heaps of great things to do in Darwin! Our historical city may not be the biggest in Australia, but we’ve certainly stuffed it to the seams with excitement and style. The Darwin Harbour and Waterfront precinct is a great place to start your adventure. 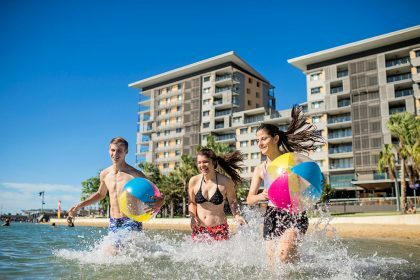 Check out the new wave pool and recreation lagoon located at the Darwin Waterfront precinct off Kitchener Drive. With a range of different wave formations, some up to 1.7m high, the wave pool provides hours of entertainment for people of all ages. 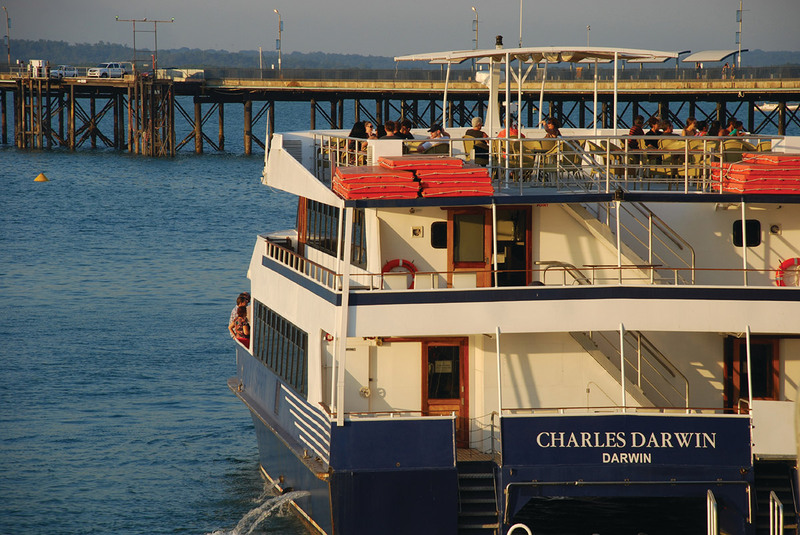 If you prefer to stay a little drier though, head down to Darwin’s Stokes Hill Wharf. 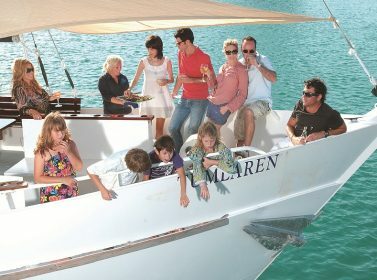 Take the family to the dedicated fishing platform, it’s free and if nothing bites, there are plenty of alfresco dining options. 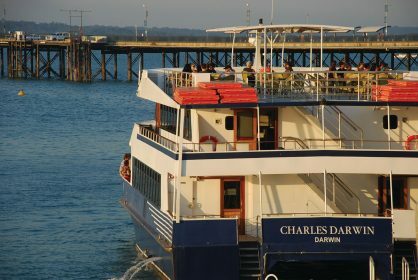 While in the area, check out the Deckchair Cinema for a unique Top End experience under the stars or take it back a notch with a sunset cruise with Darwin Harbour Cruises. And if you have brought the kids, remind them just how good they’ve got it with a little history lesson at Darwin’s Fannie Bay Gaol. ‘Her Majesty’s Gaol and Labour Prison’ was closed for business in 1979 after almost one hundred years, but is open to the public between 10am and 4:30pm most days. 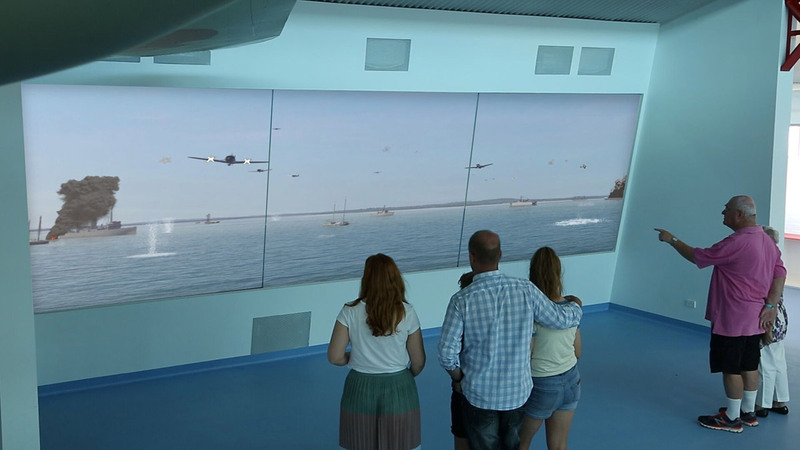 While on the subject of history, the Darwin Defense Museum is a an interactive and immersive experience that explores Darwin’s important role in WWII. The exhibition space includes the Bombing of Darwin Gallery, iconic objects from that time, firsthand accounts and multimedia presentations. Another “must see” in Darwin is the Museum and Art Gallery of the Northern Territory. Get an insight into the destruction of Cyclone Tracy and learn more about the Larrakia (Saltwater) people, the traditional custodians of Darwin. Entry is free and open from 9am – 5pm. 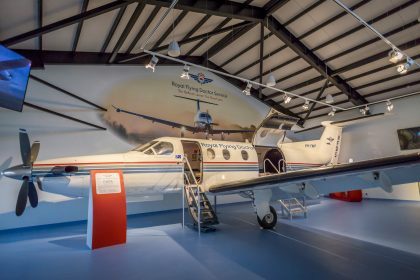 Make sure you check out Darwin’s latest attraction, The Royal Flying Doctors Service (RFDS) Tourist Facility which shares the stories of the RFDS from its early beginning to now and the the Bombing of Darwin Harbour that rocked Australia during WWII. 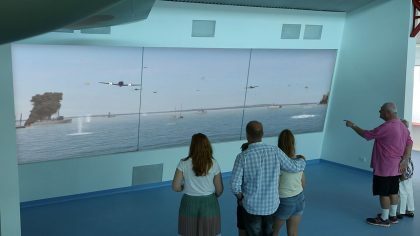 See, experience and learn through the wonder of technology as this facility brings history to life. The attraction is open from 9:30am – 6:00pm every day. Closed on Christmas Day & Good Friday. Of course, no trip to would be complete without a visit to Darwin’s famous Mindil Sunset Markets. Operating Sundays and Thursdays (from the last Thursday in April to the last Thursday in October), the markets are the perfect place to take in the vibrant colours and flavours of the Top End. The hardest decision is going to be which tasty food stall to visit first! Darwin is the gateway to some of the most striking national parks in the World. 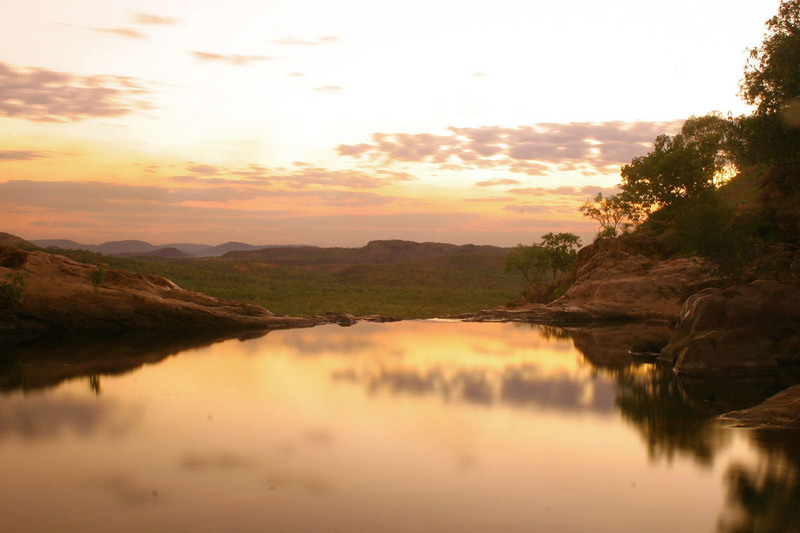 Don’t miss Kakadu National Park, the largest national park in Australia, covering almost 20,000 square kilometres. That’s nearly half the size of Switzerland! Recognised as a global treasure, World Heritage listed for both its environment and our living Aboriginal culture. 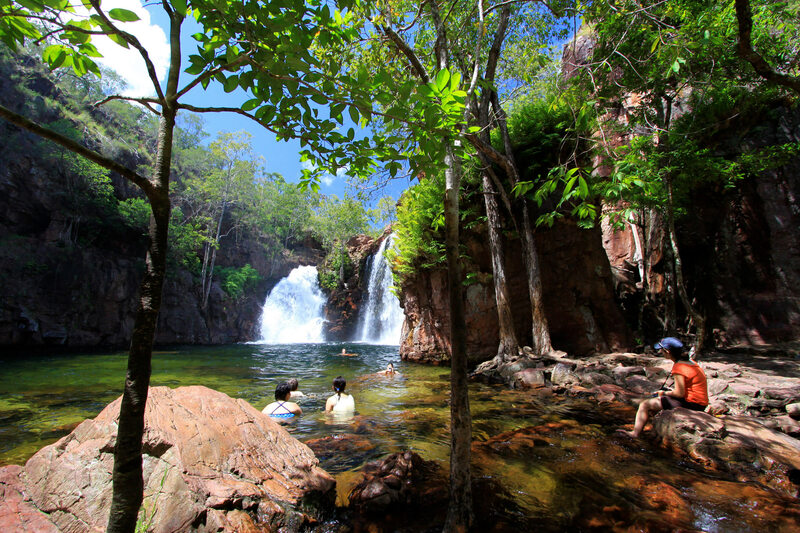 Closer to Darwin is the popular Litchfield National Park. Famous for it’s huge termite mounds, rock-holes and waterfalls, it is a popular day trip year round for visitors and locals alike. While out of Darwin, why not take combine a boat trip on the Adelaide River and see Saltwater crocodiles in their natural environment? Spectacular Jumping Croc Cruise offers an up close view of these magnificent creatures as well as access to amazing bird life. 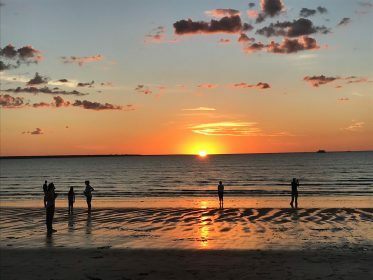 With our tropical climate, stunning beaches, open-air markets, bustling nightlife, access to some of the most amazing National Parks and of course – some of the largest Saltwater Crocodiles in captivity at home at Crocosaurus Cove; there’s no shortage of fun and exciting things to do and see in beautiful Darwin. Check out HotelsCombined for an array of accomodation options in Darwin.